Today I am publishing an interview with Richard Stallman, the founder of the Free Software Movement, and of the Free Software Foundation (FSF). In the 1970s, Stallman was a legendary hacker at MIT's AI Lab. He left in 1984 to found the FSF, and to start the GNU project. He is also the author of the GNU General Public Licence (GPL), the licence most widely used by open source software programmers, and the model on which Creative Commons licences are based. This is the second of The Basement Interviews, the introduction of which I am publishing on my blog. The full article (including introduction) is available as a downloadable PDF file (see below for details). This is published under a Creative Commons licence. Richard Stallman was born in Manhattan, NY, in 1953. An only child whose parents divorced when he was nine, Stallman led a solitary childhood. Talented in math and physics, and with a fascination for reading about ancient civilisations, he became obsessed with computers long before he had access to one, and at the age of nine he was writing computer programs on paper. It was at the AI Lab that Stallman developed his ideas about Free Software — a process kick-started by his failed attempt to adapt a Xerox printer to automatically alert users when their print jobs had completed. To do so Stallman needed the printer source code. This was denied him, on the grounds that it was proprietary information. Angry that without it he was unable to make things better for his colleagues, Stallman began pondering on what he calls "the ethics of the issue." His conclusion: sharing information is an important way in which humans co-operate, so anyone refusing to share source code is committing a hostile act. But it was a subsequent event that was to prove the real incentive for founding the Free Software Movement. In the early 1980s MIT decided to license the LISP system it was developing to two spin-off companies — Symbolics and LMI — set up by ex-hackers. One of these companies, Symbolics, later announced that it would not allow MIT to copy across to its own system any of the improvements and additions made to the software by Symbolics. Interpreting this as an aggressive attempt to kill off the MIT system, and so make the AI Lab dependent on Symbolics, Stallman embarked on a legendary hacking campaign, independently replicating on the MIT system all the improvements made by Symbolics (and also passing them on to the competitor spin-off company LMI). Stallman's efforts were later memorialised by author Steven Levy in his book Hackers. Eventually the AI Lab switched to a newer Symbolics machine — a machine on which the MIT software Stallman had been working on couldn’t run. Concluding that the MIT system was now "non-free software", and convinced that his community had been “destroyed", Stallman decided to launch a project devoted to writing "free software", and in January 1984 he left the AI Lab in order to do so. From that point on Stallman has dedicated his whole life to the cause of Free Software. In 1984 he launched the GNU project, with the aim of developing a free UNIX-like operating system; in 1985 he founded the Free Software Foundation so that programmers could be employed to help write the GNU system; and in 1989 he created the General Public Licence, or GPL — a revolutionary new type of copyright licence that he dubbed "copyleft". What is revolutionary about copyleft is that it exploits traditional copyright law — whose very raison d'être is to make creative expression proprietary — to achieve the opposite effect. By attaching a copyleft licence to their software, developers are able to assert ownership, but then give away some of their rights — particularly the right to copy and modify the software in order to allow others to build on it. In doing this, rather than simply placing the software in the public domain, they (the creators) are able to stipulate the terms on which they are making the software freely available, and so control how it is used by others. To better express his vision, Stallman articulated the “Four Freedoms of Free Software". These are: the freedom to run a program as you wish; the freedom to study the source code and change it to do what you wish; the freedom to make copies and to distribute them to others; and the freedom to publish or, more generally, distribute modified versions. Nevertheless, Free Software has been widely misunderstood: As Stallman frequently has to stress, Free Software does not imply software that is "free of charge", but software that users are free to run, study, copy, and redistribute modified versions of. As such, its source code must always be freely available, and it must never be made proprietary. For this reason the GPL doesn’t only specify that software licensed under it must be free, but that the software code must remain free even when it is modified and redistributed. This latter characteristic is often described — to Stallman's ire — as having a viral effect, since it encourages the proliferation of Free Software. By the early 1990s the GNU operating system was practically complete. However, following the repeated delay of its kernel — the GNU Hurd — the system lacked a vital component. Into this vacuum flowed Linux, a free kernel developed in Finland by Linus Torvalds. Since Linux was also UNIX-based, it was compatible with the GNU system — so hackers began to combine Linux with the GNU components to create a complete operating system, and a plethora of GNU/Linux "distributions" quickly spread around the world. To Stallman's growing dismay, however, these distributions were increasingly referred to not as GNU/Linux, but simply Linux — a shortening that not only ignored Stallman's pivotal role but, to his frustration and anger, the philosophy behind Free Software. To his further dismay, in 1998 the Open Source Initiative was launched. Adopting a more pragmatic and business-oriented approach, open source advocates played up the technical benefits of the GNU/Linux system, and downplayed Stallman's concepts of freedom. In short, the very community he had set out to help was undermining Stallman's aims. Non-cognoscenti often struggle to understand the subtleties between Open Source and Free Software. After all, both groups believe that the source code of computer programs should be freely available, and most open source software is still licensed under Stallman's GPL. In those subtleties, however, lies an ideological gulf. On the open source side the emphasis is on creating better, cheaper and more efficient software. Free software advocates, by contrast, continue to stress the philosophy of the four freedoms outlined by Stallman — for FSF advocates it is an issue of ethics and ethical behaviour, not technical superiority. Open source advocates also highlight the merits of the new software development model pioneered by Torvalds when creating Linux (and compellingly articulated in 1997 by Eric Raymond in his essay The Cathedral and the Bazaar). In short, by exploiting the Internet, Torvalds was able to organise and co-ordinate thousands of geographically dispersed volunteer developers to write software code in a new and more efficient manner than had historically been possible. Raymond characterised this as being like a bazaar, in which a babble of different agendas and approaches is — somewhat counter-intuitively — able to produce a better end result than the top-down approach famously enunciated in 1975 in by Frederick Brooks in his book The Mythical Man-Month. Brooks' view was that writing software is like building Reims Cathedral. As such, he argued, its design "must proceed from one mind, or from a small number of agreeing resonant minds." Raymond, however, argued that the Bazaar approach developed by Torvalds both speeds up development time, and reduces the number of bugs. As he put it: "Given enough eyeballs, all bugs are shallow." In other words, given a large enough pool of peer reviewers, every problem will be obvious to someone, and so fixed. Since Free Software is about ethics, not efficiency, for Stallman such technical benefits are merely a bonus, not an essential requirement. Moreover, he argues, focusing on technical superiority distracts people from the underlying philosophy of Free Software. But asked to choose between Free Software and Open Source software, and often struggling to understand the philosophy of Free Software, hackers increasingly embraced the Open Source vision — which rapidly acquired greater mindshare than the more rigorous ethical approach promulgated by Stallman. As a consequence, says Stallman, it is now hard to find a distribution of GNU/Linux that meets the FSF's definition of free, and "the goal of making a completely free operating system has been not just forgotten but almost totally cancelled." Unprepared to compromise over the dilution of the free software philosophy, and a frequent critic of the Open Source Movement, Stallman has become a controversial figure. Nevertheless, the GPL remains a core component of both the Free and Open Source software (FOSS) movements. Whether it can maintain this centrality, however, is debatable. Current attempts to develop Version 3.0 of the licence have attracted considerable criticism. Specifically, the new licence's attempts to prevent the merging of free and proprietary software into a single system, and its anti-patent and anti-DRM provisions have not been well received by some. In January, for instance, Torvalds indicated that he did not intend to convert Linux to v3 because of its digital rights management (DRM) provisions. Few, however, dispute the seminal contribution Stallman made to what one might call the wider "free knowledge movement", and he remains a force to be reckoned with. The GPL has also been highly influential outside the software space. The increasingly popular range of Creative Commons licences, for instance, is a direct extension of copyleft principles to other media, including text, video, and music. In recent years, Stallman has also become a very effective campaigner against corporate and government attempts to allow software to be patented, and he is an energetic and constant critic of digital rights management, which he prefers to call "digital restrictions management". In 1990 Stallman received a $240,000 MacArthur fellowship. This ended in 1995, and today he survives courtesy of the constant speaking invitations he receives. He is, he says, now like a medieval king, who has to keep moving in order not to be too great a financial burden on his subjects. I catch up with Stallman in Brussels, Belgium, where he has come to attend a public demonstration against software patents. He is ensconced in an apartment in the French quarter, across the way from a chestnut-tree-lined park that, on this sunny afternoon, is home to a medley of prams, dogs, bikes, and flies. Stallman himself answers the door. Without his shoes on, he is considerably smaller than I envisaged. His long curly black hair, now going grey, and untidy shaggy beard make him the very picture of what my wife's Scottish Aunt Nonie would have called a "Heery Oobie" [aka hairy hippie]. His green eyes meet mine unemotionally; they seem almost puzzled. As he appears unsure of the formalities I push my way in and shake his hand. We climb a flight of stairs and walk into a long room with a wooden parquet floor partially covered with red rugs. At the stair end is a wooden table and benches. On the table is placed a bottle of red wine, some cheese and a bag of chocolate chip cookies. At the other end of the room is a long green wooden bay window. Positioned around the room are several pieces of antique wooden furniture, possibly walnut. In one corner is a large TV; in another a hi-fi system. On the floor is a very large toy bear. We move across to the window end where two large sofas are positioned beside each other to form an L-shape, both also covered with red rugs. A nearby coffee table is heaped with books and paper. Stallman sits on a sofa with his back to the window, a laptop computer whirring beside him. I perch on the other sofa, beside a beautiful black cat that sleeps throughout the interview. Stallman is wearing a red T-shirt that sits uncomfortably on his potbelly. I note that half way along his forearm, up and over his elbow, is a long scar — a remnant of several painful operations following a bad fall in an icy airport in Finland. I have already had a couple of phone conversations with Stallman, during which he revealed himself to be a somewhat bad-tempered interviewee. An odd mixture of the amiable and the irascible, he is willing to share oceans of time with journalists and email enquirers, but snappish and irritable when answering their questions. Today he is especially crotchety. As he talks his voice oscillates between a pleasant Jack-Nicholson-like baritone and the peeved falsetto of a frustrated adolescent; the latter occurring whenever he concludes that his interlocutor is being obtuse, or asking stupid questions. Before we start Stallman walks to the hi-fi and inserts a CD. It turns out to be The Antenna Repairmen, an "experimental percussion trio" with a passion for ceramic instruments; these range from udu drums and bowls, to tubes, vases, and ghatams. As a consequence, our conversation is interspersed with odd percussive noises, and the muffled rattle-and-cracking sound one might envisage emanating from the kitchen of an inebriated chef. All in all, it seems an appropriate accompaniment to Stallman's querulous mood. For the first part of the interview Stallman lounges on the sofa minutely examining his split ends, and picking at his hands and T-shirt. Every now and then he sits upright and snaps: "That is total confusion; I can't answer that"; or: "I don't understand what you are talking about." At one point he accuses me of misrepresenting something he said; another time he complains that my questions are driving him "nuts". When I counter that he is a somewhat combative person he gets up from the sofa and spends the rest of the interview on his feet, occasionally taking sauntering walks to the further reaches of the room to grab a chocolate chip cookie, now and then throwing out his feet in small dance kicks. (In his younger days, Stallman was a folk dancing aficionado.) At one point he begins playing with and pummelling the large toy bear on the floor. Two hours later the black cat sleeping next to me gets up, stretches, and starts to scratch the rug on the sofa. I take this as a signal for me to depart. As I am about to leave, however, Stallman engages me in conversation again at the stair head. Having earlier refused to comment on anyone from the Open Source Movement, he now invites me to sit at the wooden table at the end of the room, and turn my tape recorder back on. Then, between mouthfuls of cheese, he starts to complain about how Eric Raymond always exaggerates his early contribution to Free Software. Raymond does this, Stallman asserts, in order to give his later apostasy greater weight. With this extra material on tape I slip back into the sunny streets of Brussels, conscious that a film crew will shortly arrive to interview Stallman in connection with a documentary they are working on. 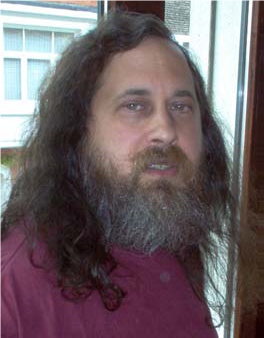 Stallman's parting had been as abrupt and unceremonious as his welcome. Walking back to my hotel I conclude that, struggle as he might to connect with others, and impatient as he may become with them, Stallman craves the company of people. Indeed, I formed the impression that he had held me back not because he wanted to rant about Raymond, but simply because he didn’t want to have to sit on his own until the film crew arrived. *** This interview was undertaken before the process of drafting GPLv3 began. Consequently there is no discussion of it with Stallman. A companion interview with Eric Raymond is available here.